The semicolon is one of the most misunderstood, misused, and underappreciated punctuations; like other divisive topics (Oxford comma, anyone? ), it has its share of outspoken supporters and detractors. 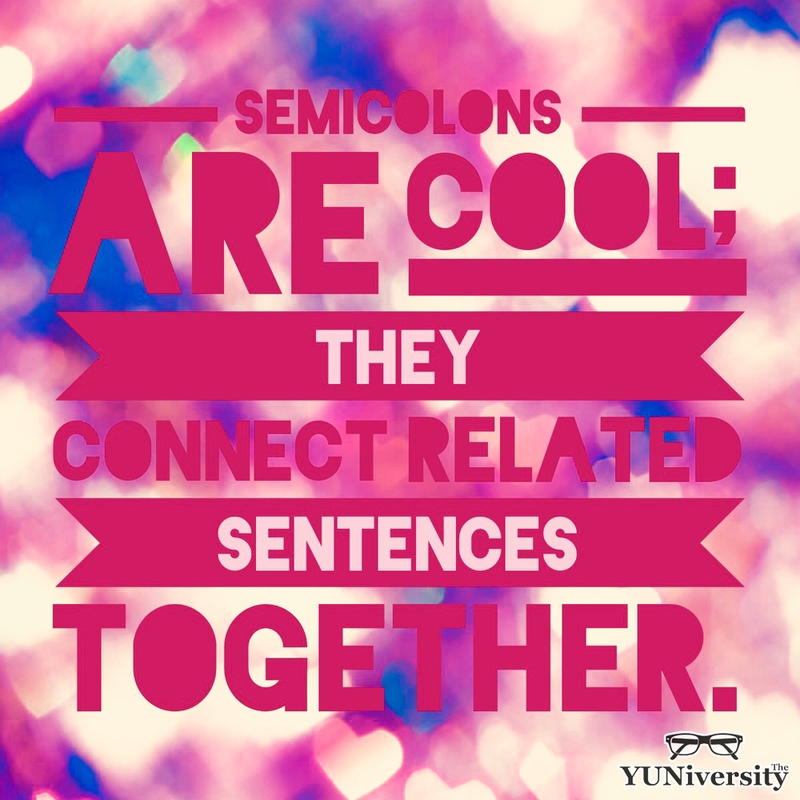 A semicolon combines two sentences together, and in doing so, connects their ideas. 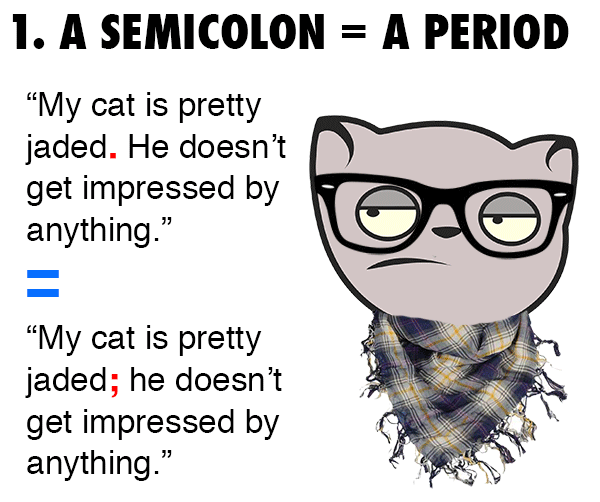 Therefore, semicolons should connect two closely related sentences. Chewie is not likely to be depressed because Maswingo isn’t the capital of Republic of Zimbabwe, so we shouldn’t connect those two random thoughts with a semicolon. I’ve seen Katy Perry perform in Austin, Texas, Chicago, Illinois, Boston, Massachusetts, and San Diego, California. For people whose kryptonite is U.S. geography, trying to figure out whether the above sentence is talking about eight places or four would be comparable to evaluating a trigonometry function without a calculator. 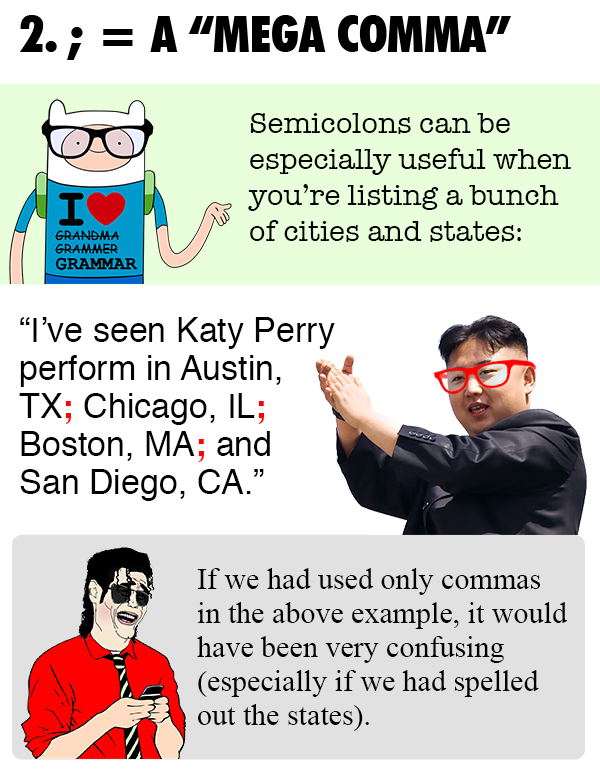 But by using semicolons in the appropriate places, it becomes obvious that the example sentence is talking about four places. In closing, keep in mind that it is possible to overuse semicolons; combining too many sentences in proximity with semicolons can make your writing seem endless; therefore, exercise restraint and use semicolons where they would be most effective.